Happy Saturday everyone! The weather here is gorgeous. A few days of warm weather before the winter weather returns. It is a welcome respite. Here is another Valentine's Day Card. This card uses the Storybook Cricut cartridge and a clear embossing technique. Here is my first Valentine's Day card of the season. I used the Simply Sweet Cricut cartridge for the heart and made my own chipboard heart. The paper is from My Mind's Eye Love Me Do Collection! I used white embossing powder for the letters. Happy Saturday everyone! I hope all of my Oklahoma friends are ready for the blast of arctic air that we will be getting Monday. I imagine the grocery stores will be busy today!! Anyway, I hope you are warm where you are. 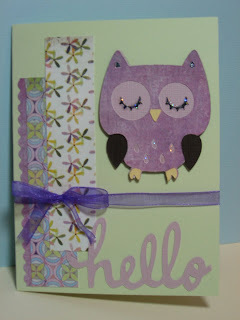 Here is a quick card made using the cute Pixie-licious paper from Cosmo Cricket.